We are thrilled to offer ABIDE, a brand new (and free!) resource for deepening you intimacy with Christ! Subscribers will also receive blog updates. We value our community! Abiding in Christ is foundational to spiritual growth and successfully living the Christian life. While most of us know this, the instruction to abide can remain vague, elusive and hard to get our minds around. Jesus didn’t intend for it to be a difficult concept, however. A careful look at scripture reveals the often overlooked key to abiding in Christ. 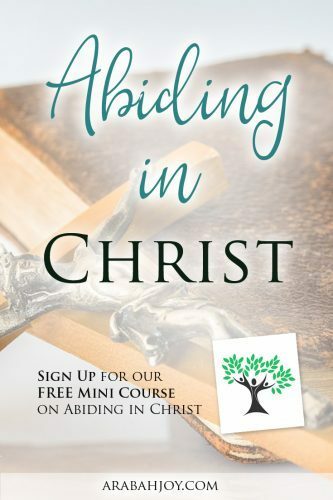 This brand new resource gives an overview of what it means to abide and, more importantly, delves into the practical, biblical tools for abiding in Christ. Paul’s most repeated phrase in his letters centers around this concept of abiding in Christ. When you pair Jesus’s words in John 15 with Paul’s instructions for living in Christ throughout the New Testament, you find something truly life changing. It has been rich to delve into what this means for us as believers and I’m thrilled to offer this spiritual growth resource free to subscribers! To sign up for the FREE 5 day course, simply subscribe below for updates. Drop your email address in the box and hit “subscribe.” The course will automatically deliver to your inbox, along with blog updates from ArabahJoy.com. I look forward to learning with you! This is off subject but I missed registration for the blog coaching. How can I get the course? I really need it. Will you present it again soon or do you accept late registration? 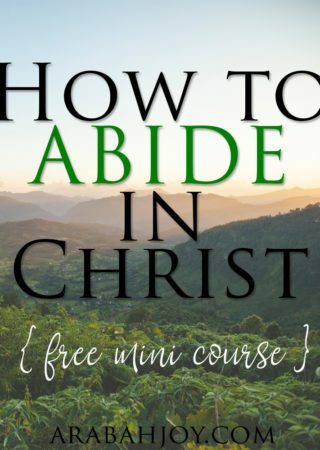 I have been trying to get the Abide mini-course–can you email it to me please? AJ, hi, I missed day one, how do I start over? Greetings. I am a subscriber and saw this on a Facebook post. Id love to do this mini course. Will you please send me a link to this? Thx. I have been enjoying some of your resources especially about prayer. I was wondering if you are affliated with a denomination or fellowship? Thank you for the wonderful resources provided by your website! Hi there! If I do the sign up now, will I still get the mini course? I receive your emails. Since this is an old post will I still receive the course via email? PS. Grace Goals was enlightening and life changing, and I’m enjoying the Promises as well. Yes, you will still get the course :) Thanks for asking!